It’s 2019, and we have mammals on our mind. Last year, Nature and Culture joined nature lovers around the world to celebrate Year of the Bird. We showcased spectacular birds found in our project areas, from the largest flying bird in South America to one of the most threatened species in the Neotropical region. As 2019 begins, we bring you a new monthly feature. This year we marvel at the magnificent world of mammals. From marsupials to bats to carnivores to cetaceans, one-fourth of the world’s mammals can be found on the South American continent. To commemorate the wonder of our warm-blooded friends, and raise awareness about the crucial role these animals play in caring for our planet, we will feature a unique mammal found in our project areas each month. Today we celebrate a peculiar creature that inhabits the forests of South America. Considered a “living fossil,” this species has been around for 20 million years and has changed very little. Join us in celebrating the terrific tapir. Tapirs live in wetlands, forests and savanna, and have a range that includes Central America, South America and Southeast Asia. The areas where Nature and Culture works are home to two (out of five) species* of tapir– the lowland tapir (Tapirus terrestris) and mountain tapir (Tapirus pinchaque). Found from Colombia to Paraguay and Brazil, the lowland tapir prefers living where it’s warm, rainy and humid. Mountain (or woolly) tapirs live in the high northern Andes, in the páramos and cloud forests of Peru, Ecuador and Colombia. Closely related to horses and rhinos, tapirs have an odd number of toes (four toes on each front foot, three on each back foot). However, their most notable feature is a prehensile snout. Tapirs use their snout – which is really an extended nose and upper lip – to grab branches, leaves and fruit. It can also be used as a snorkel when the animal is underwater and as a tool to detect odors. Tapirs are shy, docile animals that frighten easily. They are primarily solitary and highly territorial. When two tapirs come in contact, they become highly aggressive towards each other. Males will often fight for a female prior to mating. Fond of water, tapirs are excellent swimmers. Mountain tapirs spend much of their time bathing to regulate body temperature and to escape from predators. These animals can remain submerged for minutes, poking their trunk above water to breathe. Tapirs are vital components of their ecosystems. As large, herbivorous mammals, they play an important role as seed dispersers. When they eat fruits and berries in one area and travel to the next, they take those seeds with them in their digestive tract and disperse them as they defecate, helping maintain the genetic diversity of plants in the forest. Additionally, when foraging, tapirs often snap branches and knock over trunks. This behavior makes more food available for smaller herbivores. All species of tapir are threatened to some degree. The greatest threat to populations is extensive habitat destruction, including habitat fragmentation and encroachment. Illegal poaching by local hunters is also a problem for mountain tapirs. With fewer than 2,000 individuals, the mountain tapir is one of the most endangered mammals in the world. In order to protect tapirs it is essential to conserve large portions of intact habitat. At Nature and Culture, we’re working to protect their home and increase habitat connectivity across northern South America. In Colombia, we joined forces with the Humboldt Institute to protect mountain tapir populations near Nevados National Park. 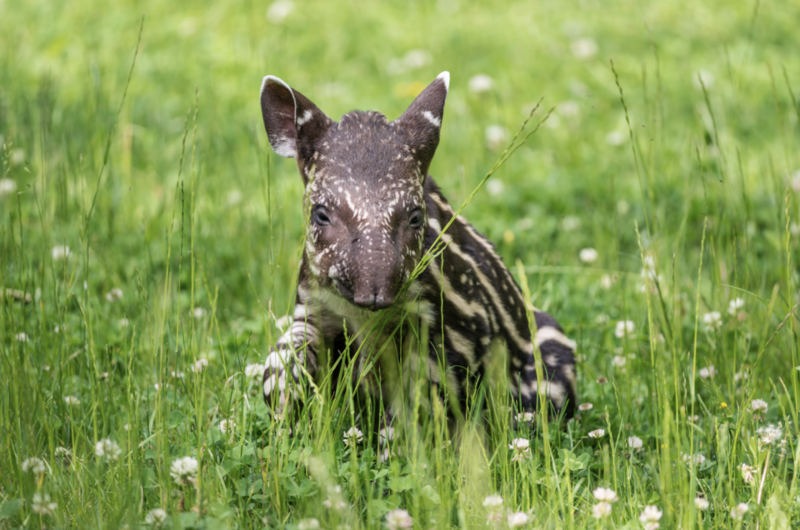 Check out this video of a rare mountain tapir sighting just last week! Most recently, we established a new reserve in central Ecuador, adding to a network of protected areas in the region spanning 7.5 million acres. Huamboya Municipal Conservation Area establishes critical habitat connectivity for the lowland tapir, spectacled bear, jaguar and more. Learn more about this incredible area here. *One of the species, the baird (Tapirus bairdi), is the tapir species with the northernmost distribution in the Americas (i.e. Central America and Southeast Mexico). Deforestation and hunting are significant threats to this unique species.